***** Cuisine Adventures- French Onion Soup. Got a real good one for you French Onion Soup fans- Cuisine Adventures-French Onion Soup! 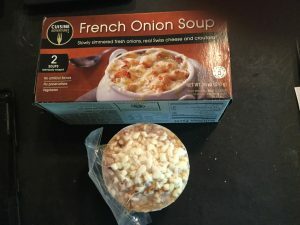 Now, just so we are straight with each other, no matter how skilled you are in the kitchen, this frozen onion soup after you microwave or oven heat it- will never-in a million years, no- make that 2 million years “look” (in the melted cheese department) as good as the soup pictured on the box above! That said, for a 5-minute microwave or 23-minute microwave/oven combo or 40-minute oven project, the soup “tastes” absolutely delicious! Jeff Eats has been “eating” Cuisine Adventures-French Onion Soup for years and like I just said, it’s delicious! Both Costco Wholesale and Trader Joe’s carry the soup! By the way, the pictured box (2 soups per box)- yesterday, ran me $4.99 at Trader Joe’s, 855 South Federal Highway, Boca Raton, Florida 33432, (561) 338-5031. Costco sells 6 packs for $10.49 which is a much better price per soup than Trader Joe’s price. Ive had this soup several times and it is terrific. If you microwave the cheese melts and just goes into the soup. Oven cooking is a drop better but Jeff is right on the picture looking better than reality.